This is the second article in my miniseries dedicated to helping photographers put together the right astrophotography kit. In the first article, we dove deep into camera selection and determined that full frame cameras always outperform cameras with smaller sensors. But, at the same time, it is undisputed that APS-C and even Micro 4/3 cameras can now be used successfully in extremely low light conditions. We also identified the best astrophotography cameras in three categories – Full Frame, APS-C, and Micro 4/3. The goal of today’s article is to find the best lens for astrophotography to complete your night photography kit. Before we start comparing different lens models, let’s define the most important characteristics of a good astrophotography lens. I consider astrophotography to be a subunit of landscape photography because, in most cases, the night sky is composed as part of the landscape surroundings. 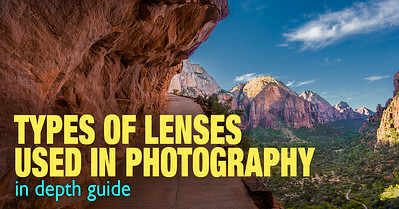 And, wide and ultrawide lenses rule the world of landscape photography. The wide angle of view is even more critical in astrophotography. One of the main subjects and attractions of night sky photography is the Milky Way, which is vast and covers the entire sky. To capture its core and include a point of interest in the foreground, you have to go as wide as possible with your capture. I consider the best focal length for astrophotography for Full Frame cameras to be between 14mm and 18mm with an acceptable upper limit up to 24mm. For APS-C cameras, the perfect range is between 10mm and 14mm, up to 16mm. For Micro 4/3 cameras, the perfect range is between 7mm and 9mm with an upper limit of 12mm. Lenses for photographing the night sky must be fast. Because of the Earth’s rotation, your choice of shutter speed is limited between 20 and 30 seconds. If you go beyond that, you will get soft, blurry stars and star trails. Generally speaking, you need a lens that is at least f/2.8 or faster. The f/4 is not enough to cover all the scenarios of astrophotography. You absolutely need a lens with a good optical performance. If you can get away with using subpar or kit lenses when there is an abundance of light, that is not the case with night photography. 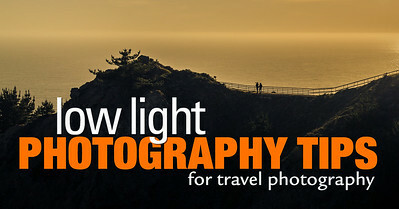 The long exposures of 20 to 30 seconds will amplify all the shortcomings of your lenses. But guess what? The combination of a fast, wide-angle lens with good optical performance always meant extremely high prices. For example, the Nikkor 14-24mm f/2.8 lens from Nikon was the lens of choice for many astrophotographers for years. It has a price tag close to $2,000. Another popular model for shooting stars is Canon’s 14mm f/1.4 prime lens, which is even more expensive. For a long time, the price of quality lenses for astrophotography was a prohibitive factor for newcomers. But there is good news! In recent years, we are seeing new lens models from Eastern Asia that are exceptionally built and reasonably priced. The most important lens company for astrophotographers is Samyang, which sells lenses under a few different names—Samyang, Rokinon, and Bowens. Samyang’s approach to lens design is simple—they concentrate on optical quality and strip away the rest. The company builds manual prime lenses without zoom, autofocus, or image stabilization. This strategy allows them to build affordable, compact, and high-quality lenses. Since you do not need autofocus or in-body stabilization when shooting stars, Samyang lenses have become increasingly popular among astrophotographers. Even if you have a lens with autofocus, you always switch to manual mode and in-lens image stabilization is not effective at such long exposures. There’s more good news—Samyang has exceptional, ultra-wide models for both Full Frame and APS-C cameras. 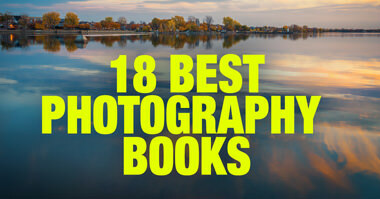 Normally, when you start identifying the best lenses for a specific type of photography, the selection varies depending on the brand of camera you use. With Samyang, this third-party manufacturer builds lenses for nearly all camera brands and mounts. The exception is This means that the selection of astrophotography lenses is universal regardless of what camera brand you use. 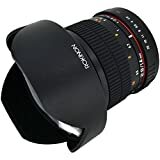 My recommendation starts with the mirrorless APS-C lenses because I shoot exclusively with cropped sensor cameras and I have more experience with lenses designed specifically for APS-C cameras like the Rokinon 12mm f/2.0. 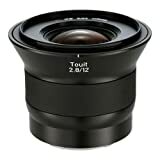 I consider the Rokinon 12mm f/2.0 to be a very unique lens. First, it is the lens that was designed specifically for mirrorless cameras. It is tiny, which is extremely rare for ultrawide, fast lenses. The minimum focusing distance is 20 cm (7.87”), which makes it more than a landscape lens and allows us to create interesting bokeh effects. It has an amazing optical performance and it is affordable. I used the Rokinon 12mm f/2.0 with my Sony APS-C setup. After switching to Fujifilm, this was the first lens I bought. In my collection, it is dedicated exclusively to astrophotography. The Rokinon 14mm f/2.8 lens is an entirely different beast compared to its APS-C sibling. It is wide and, because the lens was designed for full frame cameras, it is big and heavy, which is exactly what you would expect from a full frame lens. But it is still way lighter compared to its Canon 14mm f/2.8 and Nikon 14mm f/2.8 competitors. 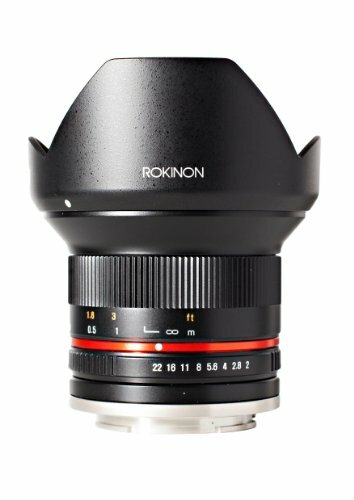 The Rokinon 14mm f/2.8 is a manual focus lens that is available in most camera mounts: Canon, Nikon, Pentax, Sony Alpha, and Sony E-mount. 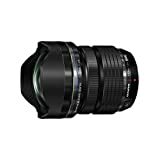 It is also available for the Fujifilm X-Mount and Micro Four-Thirds cameras, but I do not recommend such a huge lens for these compact systems. 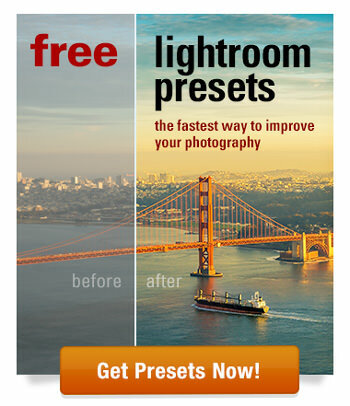 I suggest getting a compact APS-C version 12mm f/2 lens instead. The lens has an exceptional optical performance. It is sharp with very low chromatic aberration. It tends to produce a strong lens flare in certain conditions, but this is not a problem for night photography. You won’t find a wider and faster model at this price point. Have I mentioned this before? 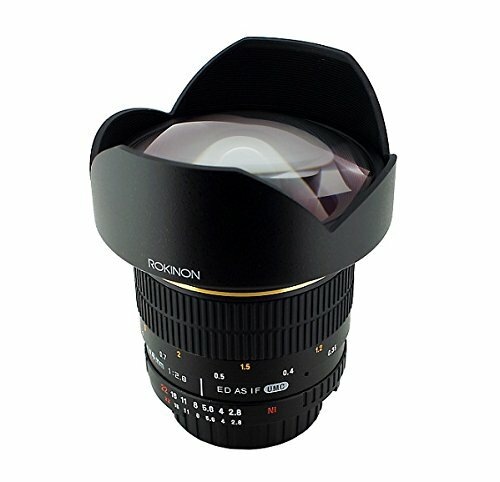 The Rokinon 14mm f/2.8 is cheap! It makes an ideal first full-frame lens for astrophotography. 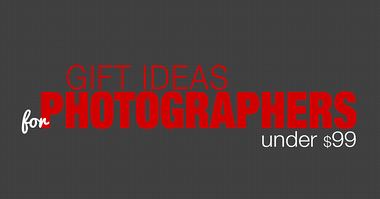 Now, I will give you a few recommendations for different camera mounts. Fujifilm is known for building high-quality lenses under the Fujinon name. The Fujinon XF16mm f/1.4 is arguably the best lens Fujifilm ever designed and it makes for a great astrophotography lens. It might not be wide enough compared to the 12mm models, but it is much faster with superior optical quality. On the other hand, the Fujinon XF14mm f/2.8 model is wider, but two stops slower and makes another great option for night sky enthusiasts. When Tamron introduced the Tamron 15-30mm f/2.8 model, it surprised the photography community because they managed to overpass native lenses from Canon and Nikon in terms of quality and at a lower price point. It is a highly versatile zoom lens with unmatched optical performance. Of course, I also included the tried and true Canon EF 14mm f/2.8L , which many astrophotographers used for years. In my opinion, if you only need a dedicated lens for astrophotography, the Rokinon 14mm f/2.8 is the optimal choice. The Tokina 11-16mm f/2.8 is an older model that was first introduced in 2000. Since then, it’s been the ultrawide zoom lens of choice for many APS-C camera shooters. It has a unique combination of optical quality, a useful zoom, a fast and constant aperture of f/2.8, and it is affordable. The model is still one of the most popular lenses among landscape photographers shooting with APS-C cameras. And for the budget option, there is ultrawide manual Rokinon 10mm f//2.8 model. As you can see, my selection of Nikon full frame lenses is similar to Canon. The Rokinon 14mm f//2.8 is still the best budget option for a dedicated astrophotography lens. The Tamron 15-30mm f/2.8 is the lens of choice for a fast, ultra-wide zoom that you can use for all types of photography. And, of course, you cannot go wrong with the but be ready to pay a much higher price tag. I think the selection of Nikon DX lenses for star photography comes down to if you are looking for a dedicated astrophotography lens (Rokinon 12mm f/2) or if you need something more versatile (Tokina 11-16mm f/2.8). There is a Rokinon 12mm f/2 model for the Micro 4/3 mount, but it is not an ideal option because of the crop factor. It is not wide enough for astrophotography, but it is still the best choice in terms of budget. You can go with the exceptional Olympus 7-14mm f/2.8 or the Leica 12mm f/1.4, but these will set you back over $1,000. On the other hand, if you go with the Olympus 7-14mm f/2.8 as your primary lens for landscape and travel photography, you can also use it for astrophotography. Sony produces exceptional lenses that always come with a high price. If you are looking for a budget-friendly astrophotography lens, the Rokinon 14mm f/2.8 is your best choice. 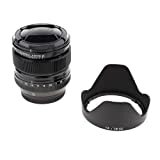 But if you want a more versatile lens with autofocus and zoom, the Sony FE 16-35mm F2.8 G lens is the best for zoom and the Venus Laowa 15mm f/2 is the best for autofocus. 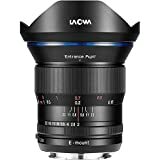 For a long time, Sony neglected the APS-C line by not producing very many lenses for the cropped mount. As a result, the options of astrophotography lenses are limited. On the other hand, you probably do not need anything other than the Rokinon 12mm f/2. 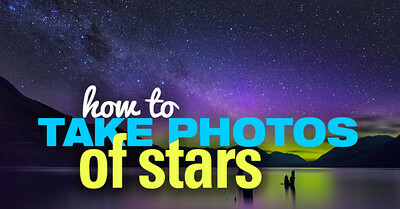 Buying the right lens for astrophotography has always been a complex and expensive proposition. But, thanks to nontraditional lens manufacturers from Eastern Asia entering the market, aspiring photographers are now a little less stressed about their lens options and the affordability of shooting the night sky.